There are a lot of ways to give and show love, but have you ever tried to actually gift wrap it? Leading up to Valentine's Day, I started thinking about new ways to do this (PSA: you have 13 days to grab a gift - I know, it sneaks up on ya, doesn't it?). I'm big on the vibey, feels-based side of life, and I realized: you totally can box up love and gift it to your sweetheart. If you care to get more into the nitty gritty, read up HERE, but basically...everything in existence has a vibration. You can ask a musician, an artist, a yogi, or a scientist, and they'll all tell you how frequencies in vibrations are responsible for things like color, density, volume (in terms of sound) or notes, temperature, and on and on it goes. This is the key factor behind those of us that are into crystals. Their vibration determines their color and design, and those vibrations correspond to things in our lives, like emotions and feelings. And yes, some of them are even on the same wavelength as love. My suggestion? Give your love those heart-centered, warm-feelings in a form that will stay with them all year long! I scoured the internet for some great ideas for you - the vast majority of them coming from heart-lead small businesses, which makes me so happy. Enjoy!! 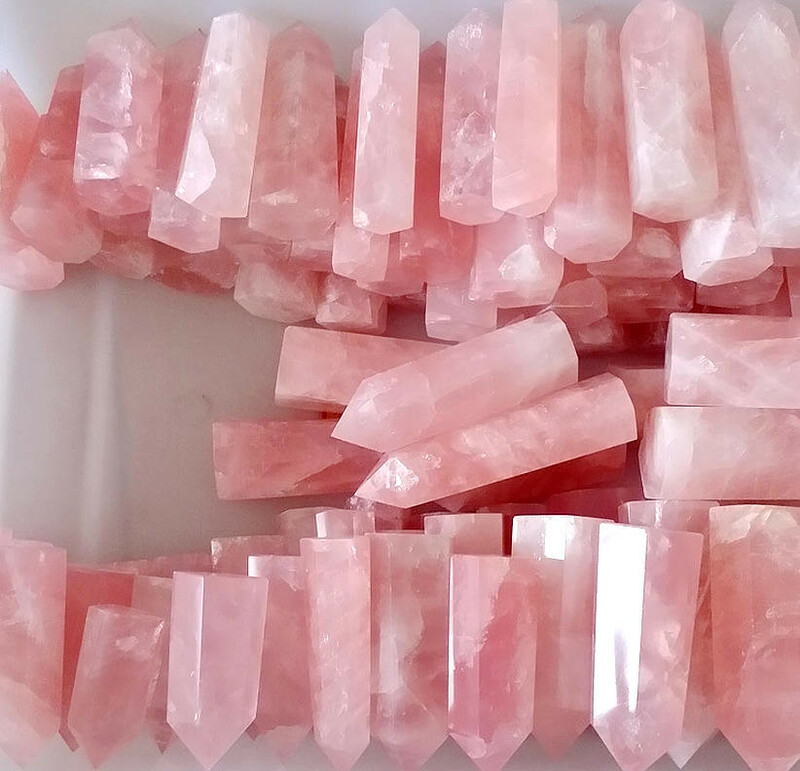 Rose Quartz is well known as the heart chakra crystal, or the crystal of love. My favorite crystal shop owner, Hollie Stark gave me this little tip: she keeps a huge chunk of rose quartz next to her bed to bring love to her subconscious and encourage kindness between her and her partner. Easy enough, right? I love to rest my little hand-held piece on my heart in savasana, or I just hold it when I need to feel a little more loving (to myself or others!) Rhodonite is also linked the heart chakra, and is great for self-love or even as support for a broken heart. Selenite isn't a heart centered crystal, but it is maybe my favorite crystal and it cleanses and charges without ever loosing its energy. The smooth heart shape is perfect for clearing negative emotions and making way for loving ones! If you or your gift recipient would enjoy larger crystals that can maybe stand on their own or for use in shrines or environmental charges, check out these bigger pieces (links above photo). The bigger ones are so beautiful and give you so much to look at and get lost in (perfect for meditation aides). Okay, I don't know about you, but I love all three of these! They each have a very different aesthetic and would work with different types of outifts/styles. A necklace with rose quartz in it is kiiiind of perfect. I mean, love is heart-centered work, so why not hang the crystal that does the job best right over her heart? I'm a total ring girl myself, and I think these are SO adorably dainty and gorgeous! The three I chose have kind of an evolving feel to them - ranging from edgy rustic to polished. All three are gorgeous and feminine, and perfect for carrying around compassionate and loving feelings without even trying. A sweet rose quartz bracelet would make a great loving gift, too. Here I chose a few options - two chain-based bracelets but one with a more polished solitary stone, and the other with small raw pieces. They each have a very different feel to them, but I love them both! The center bracelet is made entirely of small polished beads, which makes for very easy wearing, and it can pair with pretty much any outfit. I probably should have named this one home and beauty rather than health, but I think it all sort of applies. I chose some rose quartz pieces that will bring more love and compassion into your daily lives just by using them or having them around! About the water bottle: I linked to two different sites because I would trust the quality more from Spiritually Intimate, but they will sell out fairly quickly and I know that it's kind of a high price point. So if it's sold out by the time you see this or you'd like to spend less, there's an Amazon link as well. The air plant is pretty self explanatory - gorgeous and it infuses lovey, feel-good vibes to whatever room it's in! The beauty tools are used for Gua Sha, which is an Asian healing method used to promote healthy blood flow. It adds a calming self massage to your beauty routine as often as you'd like! I love crystals. I have them all over my house. Some of my fave crystals are amethyst, rose quartz, black tourmaline, sodalite & a bunch more. I'll be charging them on Monday night. I really like the rings & bracelets that you posted. They're so cute, aren't they? I love clear quartz prisms - I feel like I can actually feeeel their energy so clearly. Selenite is one of my very favorites, too.